You have 6 months to live. Death by ridiculously large asteroid is imminent. What would YOU do? It's the question that ravaged my brain going into, and coming out of The Last Policeman. Detective Hank Palace, mister main character, chose blissful nonchalance. Asteroid? What asteroid? : "A man is dead," suspected murder, only problem is, Hank is the only one that feels the need to solve the case. "Hanger," the coined term for individuals who commit suicide, an act that has lost it's taboo, and become the city-wide norm. Hank Palace is called into a particular case at a local McDonald's: a man has hung himself from a handicap bathroom rail with his own belt. Cast aside by his co-workers as yet another suicide, the case is immediately considered cold. Hank isn't having it. Convinced that the man was killed, he works his way through town, gathering evidence, and ruthlessly questioning potential suspects. "Why bother?" seems to be the consistent response to Hanks efforts. Will he eventually face reality? There are three books in this series waiting to answer that question. The tone of impending doom was at a 5.5 in this book, and there wasn't a second that went by that I didn't appreciate that. Normalcy was somewhat being held, and while civilians were resorting to the expected looting, thoughtless killing, vandalism, and theft, there was still a sense of order; wrong-doers were still punished. Ben Winters managed to make me start out with an exhausting dislike for Hank Palace. I kept shaking my head, and exclaiming out loud, "What is WRONG with you man!? The world is ending, who CARES about solving a case? Leave everyone alone!". But then came the thundering hooves of 'principle'. It was the exact idea that our main lead, this man who had built his entire life on goals, and routines, simply knew of nothing else, world-ending be damned. It was in the continuing turning of pages that I found myself sidling right up next to Hank Palace, glancing over his shoulder as he scribbled clues into his little blue notebooks, and realized that, yes, the smaller justices SHOULD be made. The world is ending, but humanity doesn't have to. 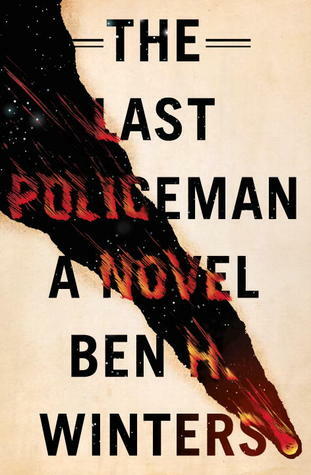 The Last Policeman had an indescribable tone. It was one that was so oddly subtle, considering the subject matter. I DIDN'T expect all hell to break loose on the next page, I knew that the story line would take it's time. And it did. There were glimpses into the degradation of modern society: phone companies slowly weaning service, electricity being cut, water use regulated, an increase of empty desks at workplaces. But it was never IN YOUR FACE, and OMG WE'RE ALL GONNA DIE, PANIC PANIC PANIC! It was like a slowly drifting iceberg, with chunks peacefully breaking away. If there was intense violence, and unspeakable human acts being committed, they were never mentioned in full-which was fine by me. I appreciated Winters' choice to unfold the story in this way. Like a fine crime/mystery novel, but with complete extinction of planet earth as a backdrop. The characters were realistically portrayed, and exuded the right amount of desperation, and "who the hell cares anymore," that one would expect of someone given a strict life countdown. But then there were those who still bothered, right along with Hank, characters like the witty Detective Culverson, and the headstrong Officer McConnell. There were personalities existing in this book that were just too infectious to ignore. Every voice was different-to the point where if I were to hear them speak aloud in the same room as me, I would be able to tell you who it was. There aren't many authors on this earth that possess that talent, let me tell you. So easy is it for one character to blend into the next. I didn't exactly come away with this solemn, or profound, feeling of lost hope. Which is what I thought I might have felt upon closing the book. I didn't exactly feel like everyone in this book was packing it in, and throwing caution to wind, because it was all ending soon. There were definitely moments that tugged at my strings, namely a moment when a pathologist expresses her disapproval of having to do her job, when she should be at her daughter's recital. But even then, I was too invested in Hank's mission to completely care that there were more important things for her to do. That's where The Last Policeman might have tangled it's wires. If it's main message was to prove how precious life is, and what the ACTUAL important moments are, it shouldn't have had such a damn good mystery plot line happening simultaneously. I eventually didn't give a rat's behind that the world was ending, I just wanted Hank to catch the bad guy!! Recommended for fans of: Mystery, Crime Fiction, Pre-Apocalyptic Fiction, The End and The Long Road-both by G. Michael Hopf. Your review is spot on. I love how the "doom" aspect never interfered with the storyline ... Have you read the secnd book yet?